The Florida Magazine Association (FMA) and the American Society of Business Publication Editors (ASBPE) have recognized Florida Trend for outstanding work. The Florida Magazine Association (FMA) and the American Society of Business Publication Editors (ASBPE) have recognized Florida Trend for outstanding writing, magazine design, website and email. 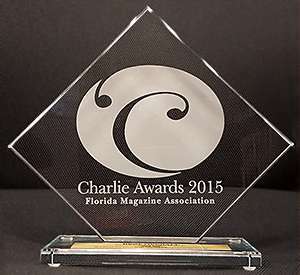 Florida Trend received a gold "Charlie Award" for Best Overall Magazine, from the Florida Magazine Association. Earlier this year, Florida Trend also received multiple awards from the Area Alliance of Business Publication. Full story on that is here. Founded in 1964 as the American Society of Business Press Editors, ASBPE is the professional association for full-time and freelance editors, writers, art directors, and designers employed in the business, trade, and specialty press. The official name was changed to the American Society of Business Publication Editors in 1997, and to ASBPE in 2012. ASBPE has chapters in cities nationwide, including Chicago, Boston, New York, Kansas City, Cleveland and Washington, D.C.
ASBPE’s Azbee Awards of Excellence program is one of the most competitive there is for business-to-business, trade, association, and professional publications. The awards recognize outstanding work by magazines, newsletters, and digital media — Web sites, e-newsletters, digital magazines, and blogs.